My sister is on a plane on her way from Mesa, AZ to visit with me for a week! 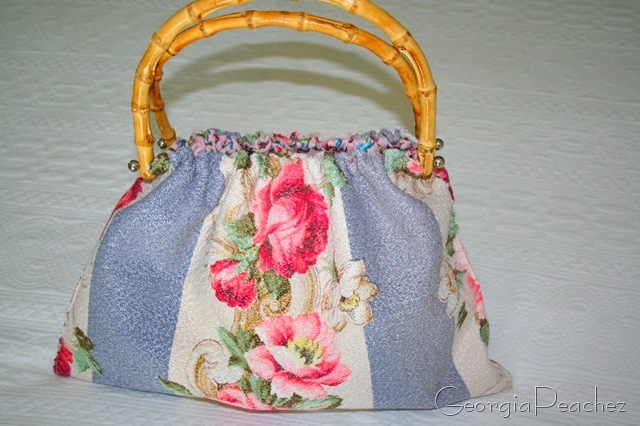 Tomorrow I want to take her to explore the cute little towns of the northern neck of Virginia and to have lunch at the fabulous Tides Inn in Irvington, VA.
We will be shopping till we drop so I thought the occasion called for a new purse. I picked out one of my most beautiful vintage pebble texture barkcloths. I've had these bamboo handles in my stash so to make it quick and easy I used them with great results. We will be visiting the Tree Streets yard sales again this year. I was there last year and it was so fabulous. I can't wait to go again. I'll be sure to brag about all my new found treasures. Off to the airport, ciao! I love it! It’s the perfect summer bag. You two are going to have so much fun! Oh, how green I am! wish my sis would come to visit …not that we would have any fun places like to shop around here….it would just be fun to have her visit…. preferably without her husband. You girls have loads of fun! Have a few drinks. Eat all you want for this most special of occasions. Shop till you drop, or run out of money. Whichever comes first. Laugh like hell. Stop and smell the roses. Enough from my camp. How Great! A New Purse and a Street with you sister,it does not get any better than that! Have a Great Time! Laugh ’til your sides hurt! I hope you have a wonderful visit with your sis! LOVE that purse. You’ve got the best barkcloth! Gorgeous bag Suzy! I love it! Enjoy the shopping trip – lucky girl – and don’t forget to reveal all on your return!